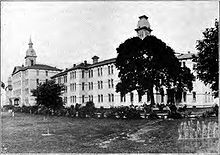 Prior to the Morningside Hospital years, the Department of the Interior contracted for care of Alaskans at the Oregon State Insane Asylum, now known as Oregon State Hospital (Salem). One of the interesting aspects of this is that the six men who died at the Oregon State Insane Asylum may be among those whose remains are in the copper canisters I wrote about on September 15. Another lead to follow the next time I’m in Oregon. This entry was posted in 1900-1929, Patient Burials, Patient List, Patient Stories. Bookmark the permalink. Post a comment or leave a trackback: Trackback URL.